The PBS Special CARRIER evokes many different reactions depending on who you ask. Some loved the series, some not so much. No matter which side of the fence you fall on, our listeners keep telling us it’s the closest view we as spouses will ever get to what it’s like living on an aircraft carrier. Just like any good evening drama, CARRIER had it share of dramatic story lines. We were introduced to young Sailors, who quickly became fan favorites. When we began the search on which crew members to invite to the show, our two guests tonight were tops on the list. Tonight we welcome Chris Altice, who we watched on the flight deck in his red shirt loading ordinance. We got to know this young father-to-be and rooted for him during his agonizing girlfriend experience. Second, we welcome the humorous Christian Garzone. His homemade videos with side-kick Phil gave us a unique insight into their world inside the ship. Christian was a breath of fresh air during series and was the 1st person our fans requested. We’ll hear from both Chris and Christian on what it was like on board during the filming, their thoughts on how well or truthful the series depicts Navy life on board a Carrier, what they are doing now and much more. We are also announcing the winners to our *Nights in Rodanthe* by Nicholas Sparks Book Contest! As always we’ll be taking your questions and your calls. 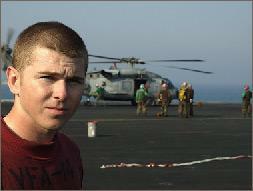 Chris Altice served for three-and-a-half years in the Navy as an E-3/aviation ordnanceman, which was his position during the deployment featured in CARRIER. 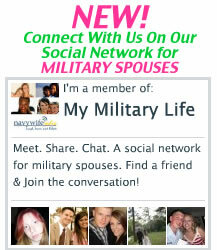 He separated from the Navy in September 2006 and is currently working and planning to attend college full-time. He was born in West Virginia and resides in Virginia, where he grew up. 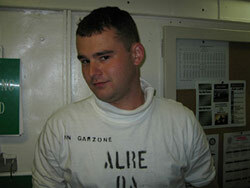 Christian Garzone has served in the Navy for four years. During the deployment featured in CARRIER, he served as an undesignated airman working in Air Department/V-2 Division. He continues to serve in the Navy; his current position is petty officer third class, mass communications specialist (aviation warfare specialist) based out of Japan. He grew up in upstate New York. Look for a Part 2 featuring more crew members from the hit PBS series CARRIER.